My next destination on my South Western tour of Turkey was the small coastal resort of Cirali and I had high expectations after the disappointment I had felt with Kemer. However after one day of exploring Cirali and the surrounding areas, I decided I was hopelessly in love with this small, unspoilt destination. Cirali has one main street in the village, no ATM machine, no local transport network and the resort does not put on any airs and graces. 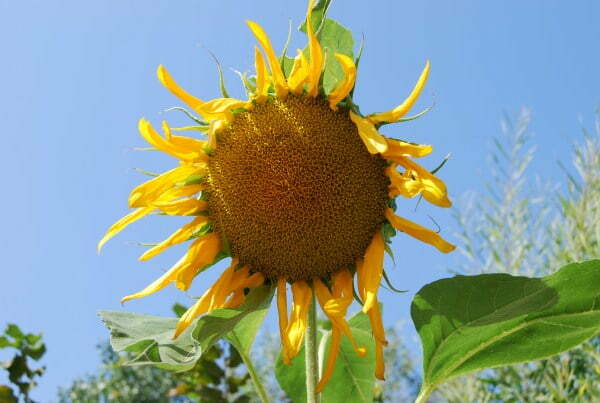 It is rustic, plain, simple and what you see is what you get. A coastal resort that is peaceful and calm while maintaining a distinct personality and welcoming strangers from outside. To get to Cirali, I got off the local dolmus bus on the Antalya coastal highway and waited for the Cirali taxi bus to fill up before the driver descended down the winding mountain road that lead to the beautiful bay. 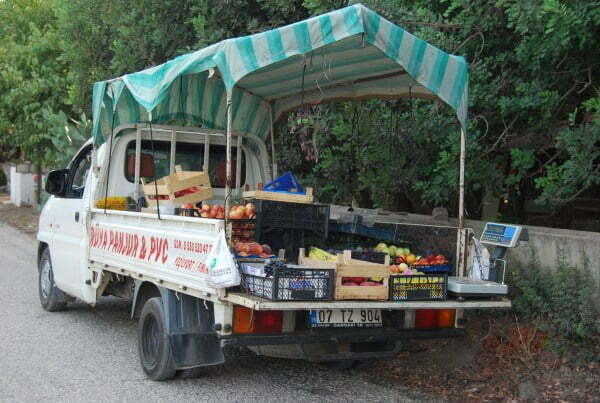 The mountain road is lined with an abundance of pomegranate trees and it eventually ends up in the main street of the village which has a few shops, restaurants and mobile sellers that do not know the meaning of the word hassle or stress. 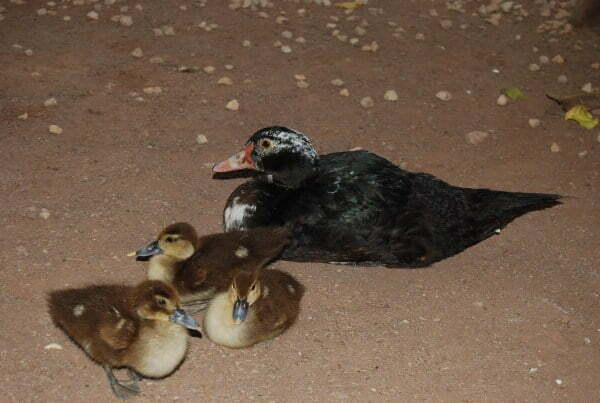 Don’t be surprised to be sitting in a restaurant eating lunch and see a family of ducks watching you. 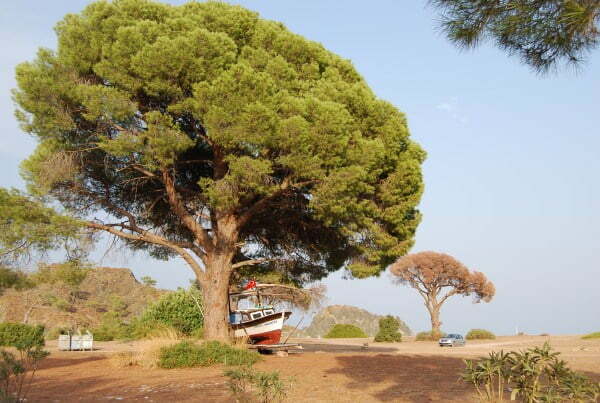 There are two modern hotels in Cirali, but the trend is traditional Turkish pansions and camping sites which are cheap and an ideal choice for anyone traveling on a budget. 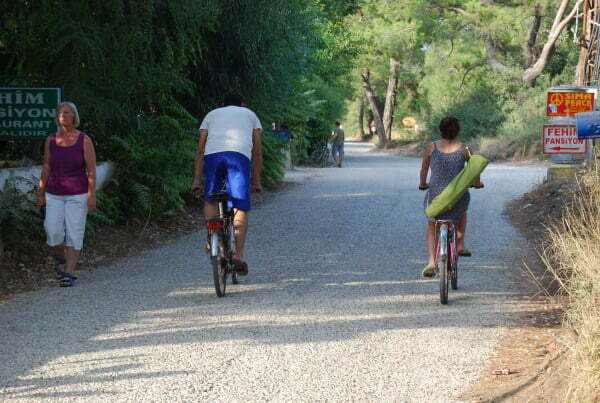 Cirali is also the alternative for couples and families who do not want to stay in the village of Olympos which tends to attract youngsters looking for a lively nightlife. Cirali is a quiet and peaceful place to head to but despite its secluded location, there are still plenty of things to do. 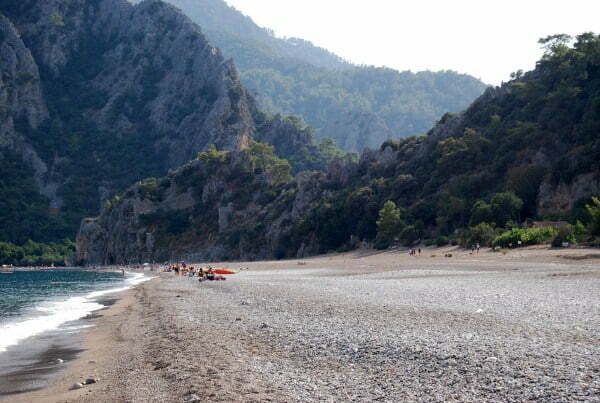 The ancient ruins of Olympos can be reached by walking half an hour along the beach and at night time head to the burning stones of Chimera located high in the mountains. To explore the surrounding areas, simply go back to the Antalya highway and catch a bus to Phaselis, the cable car of Mount Tahtali or the town of Demre where you will find the church of St Nicholas and the ancient ruins of Myra. I was disappointed to learn that I had arrived out of season and the nesting of the Caretta Caretta turtles had passed however if you are there between the months of July to September, join in with a spot of Turtle watching. If you are looking for a unique holiday destination that is not tailored to mass tourism, Cirali will be a fantastic location to choose. It has friendly vibes, is unspoilt and it is a quirky village that is firmly engrained in my memories of Turkey at its best. 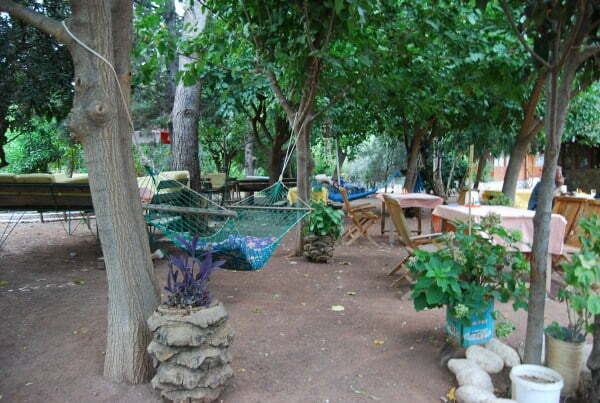 ooooh i went this last summer in Olympos,is peacefull place! Also in Phaelis! It does Alex. In a rustic kind of way, it is comfortable. Looks like it has a bit of everything! Thanks Jeff, I loved that beach. Not normally one for heading to the beach but I could sit there all day and just soak up the wonderful environment and atmosphere. Julia, it is a great alternative. I loved it. @Adrian – It is a great alternative and a place that is now at the top of my list of recommendations. Looks fabulous – just adding it to my places I’d love to go list. 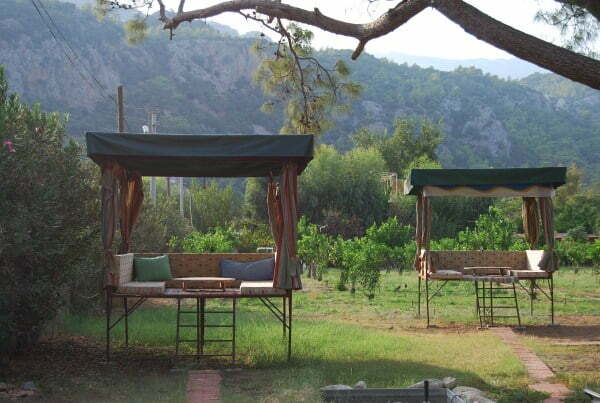 Cirali seems like the perfect alternative to the popular but often overcrowded resorts of southern Turkey. It is awesome Sid but I am sure your travels have took you to places equally as nice. @Phil and Di – There has always been some one to talk to Di. Solo travelers or couples. Hubby families is further east so not seen any of them. Doing fine on my own and plenty more posts to come. @I might have to agree with you there but Kas does come a close second. 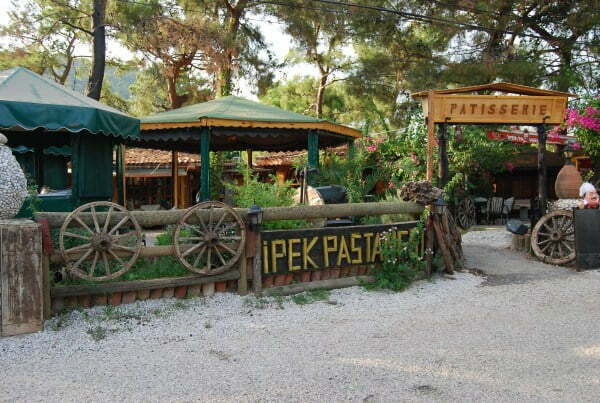 We were just around the rocks in Olympos and loved both there and Cirali. This might well be my favourite spot in Turkey. Looks fantastic. Definitely a place I would be happy to escape to. . . now this really is my sort of place. J and I were right next door about 10 years ago and didn’t realise – now we both want to put that right. Thanks for a really good and useful post. I knew you’d like Cirali. It’s the perfect place for rest and relaxation, and an idyllic base for exploring the surrounding area.